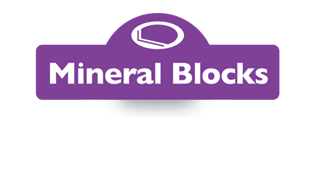 Our range of mineral and feed blocks is a highly cost-effective alternative to loose minerals or a bucket. Minimal molasses and an organic binder leaves maximum space for nutrients. There is a block to suit almost any system. High energy protected fat helps increase milk yield and growth. Use at lambing time helps reduce mis-mothering. High grade, palatable magnesium mineral for rapid effectiveness. A blend of quality proteins, trace elements and minerals to compensate for deficiencies in roughages. Calcium free to help reduce the risk of milk fever. Contains iodine to help reduce stillbirths. Contains selenium to help reduce retained cleansing.